Only $90 per person (tax incl.) at our Mississauga location. Approximately 20 poses will be taken. Proofs are uploaded to an on-line gallery to which you will receive a link. 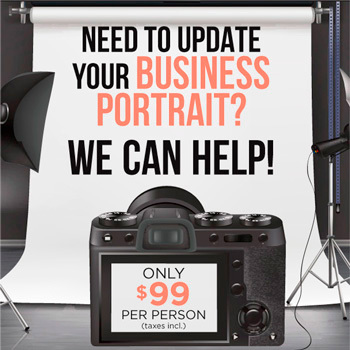 One portrait of your choice will be retouched and sent to you as a high resolution image that you may use for all of your marketing purposes. There will be a charge for the retouching of additional photos. An appointment is required and payment is due at that time. Please call Josie at 905-820-6566 (1-800-410-4510) to reserve your spot. BONUS: Colour Tech includes a $20 coupon* with each photo session which can be applied to our printed products.